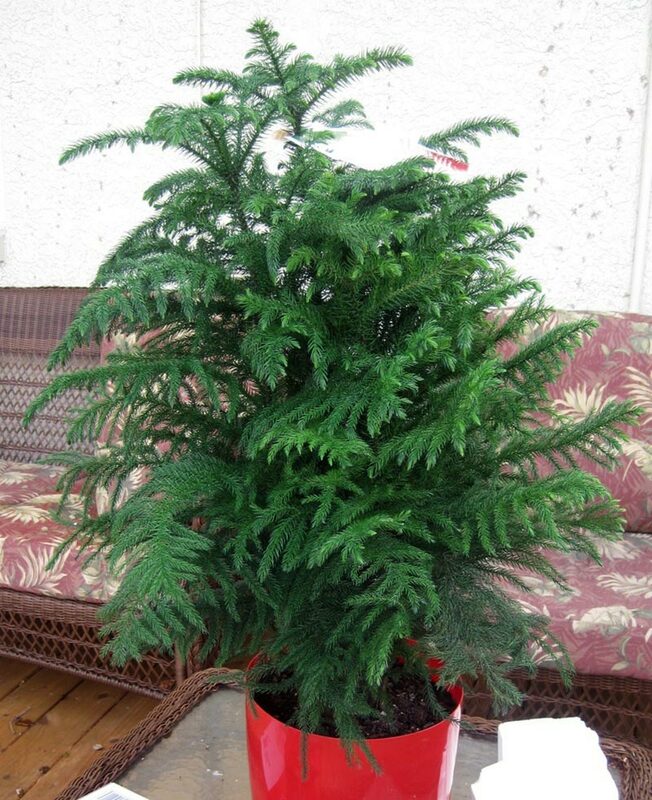 The secret to keeping Norfolk Island pine healthy is to give it ample light and humidity. In low light, the lower branches may turn brown and fall off. If the air is too dry, it becomes a prime target for spider mites, a common houseplant pest. In its native habitat, Norfolk Island pine can reach 200 feet tall, but don’t worry — indoors, it seldom grows taller than 10 feet. Norfolk Island pine is a fast-growing tree that can grow to 200 feet tall in its native habitat but seldom reaches more than 10 feet tall in containers indoors. 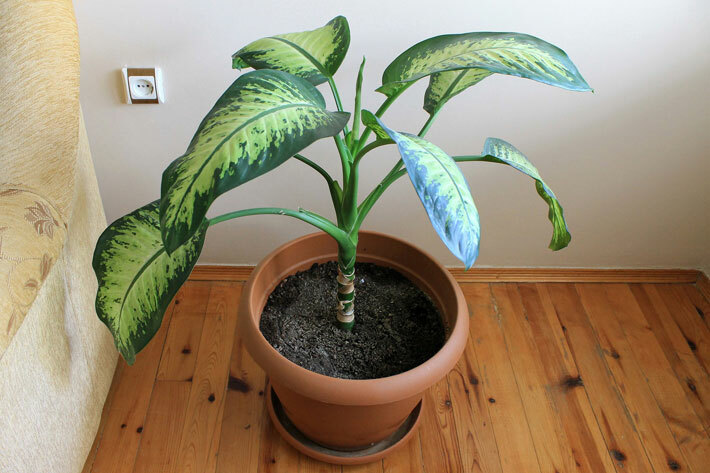 If it doesn’t receive bright light indoors, its branches droop and begin to turn brown. Keep the soil moderately dry, but give it high humidity. Why We Love It: This tree is perfect for decorating for Christmas — or giving as a holiday gift. Outside the holidays, its soft texture adds a cozy feeling to any room. Peperomias are a diverse group of small houseplants with waxy and often highly textured leaves. Red-edge peperomia (pictured) has a narrow band of red surrounding a wide creamy leaf margin. Other peperomias we love include ripple peperomia, watermelon peperomia, baby rubber plant, and silverleaf peperomia. Peperomias are small, easy-care houseplants for low to medium light. Leaves vary in shape and texture from heart-shape to elongated teardrop-shape, and deeply waffled to smooth and waxy. Grow peperomia at normal room temperature, but keep it slightly on the dry side to prevent root rot and corky spots on leaves. Why We Love It: Its waxy, colorful foliage adds a splash of color in any room — without taking up a lot of space. Note: This plant is poisonous if eaten or chewed on by dogs or cats. 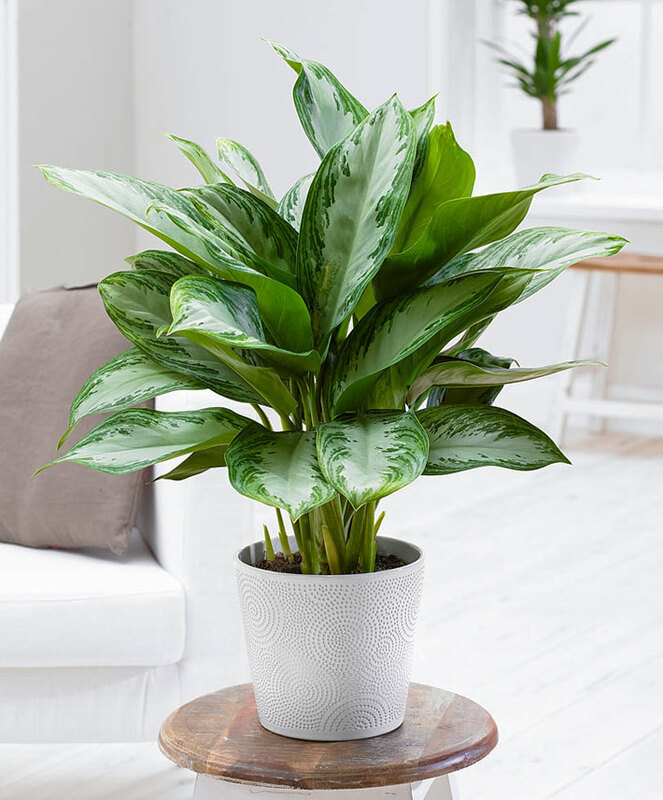 This plant has great foliage; the leaves are punctuated with shades of silver, gray, or shades of green making Chinese evergreen an attractive choice to brighten low-light areas of your home. Take a cue from shopping mall plantings and use Chinese evergreen as a ground cover around an upright, treelike houseplant. Or showcase it alone as a specimen plant. 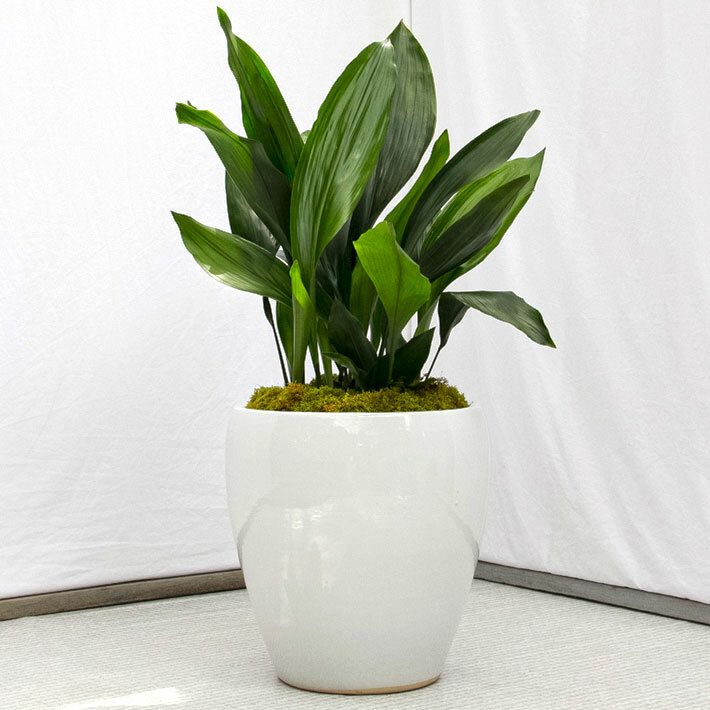 Chinese evergreen is an excellent foliage plant for low to medium light. Its lance-shape leaves are usually variegated with silver, gray, or shades of green. 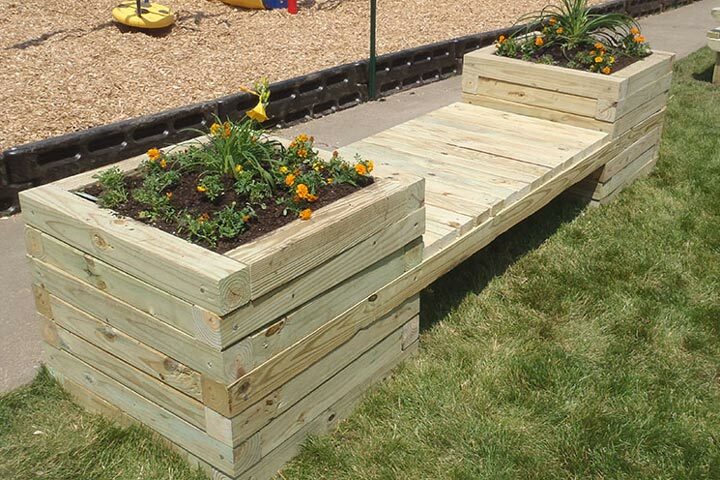 Keep the soil evenly moist and the air temperature above 60 degrees F to avoid chilling injury. Why We Love It: It’s extra tough and has attractive leaves that brighten low light spots. Note: All parts of this plant are poisonous and can cause severe irritation of the lips, tongue, and throat if eaten or chewed by pets or children. ‘Ellen Danica’, the variety of grape ivy pictured here is often called oakleaf ivy because its leaves are more deeply cut than other types of grape ivy. Regardless of the variety, grape ivy is a vine with tendrils that readily cling to a trellis or stake. It offers shiny, deep green leaves that create a very nice texture. Grape ivy, also known as oakleaf ivy, is the most widely grown species of Cissus. It has shiny, deep green leaves. The plant develops curling tendrils that cling to a stake or trellis. Give the plant medium light, keep the soil evenly moist, and grow it at room temperature for best results. Avoid overwatering, which can cause leaves to drop. Why We Love It: Even though it’s a vine, grape ivy has more of a mounding habit — so it’s a perfect choice for lush, tidy-looking hanging baskets. Fiddleleaf fig is a beautiful tree that gets its common name comes from the violin-shape outline of its leathery, deep green leaves. It tolerates low light well, though it may lose its lower leaves in dim spots. If your fiddleleaf fig grows too tall, prune stems back to the desired height, or start a new plant by air layering elongated shoots. Ficus plants range from large trees to woody shrubs to trailing vines. 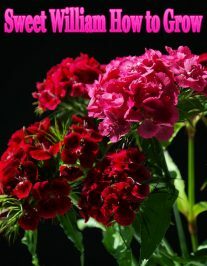 All grow best in medium to bright light, although they will tolerate low light for short periods. They grow well at normal room temperature. Allow the soil of tree and shrub forms to dry out between waterings. Ficus plants produce a sticky white latex sap when injured, giving them one of their common names, rubber plant. Edible figs are in the same genus, and these houseplants are sometimes called figs. 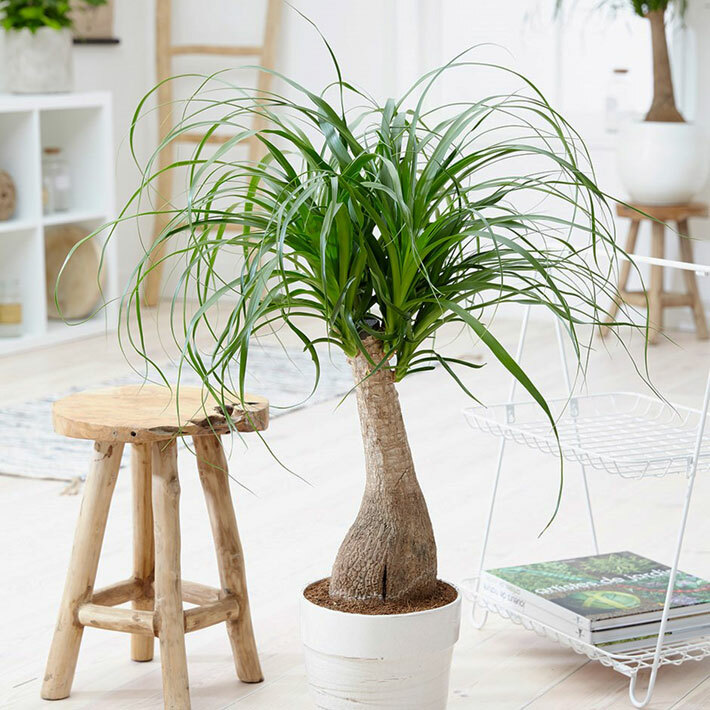 Why We Love It: This is one of the classiest-looking indoor trees thanks to its big leaves and the shape it forms as it grows. Several closely related species share the common name of dieffenbachia. All produce canelike stems with lush foliage variegated in green and white. Grow one by itself to for a tree appearance or several together in a single container for a shrubby look. One of the plant’s common names, dumb cane, comes from the effect of the toxic sap that if eaten causes swelling and numbness in the mouth and throat. 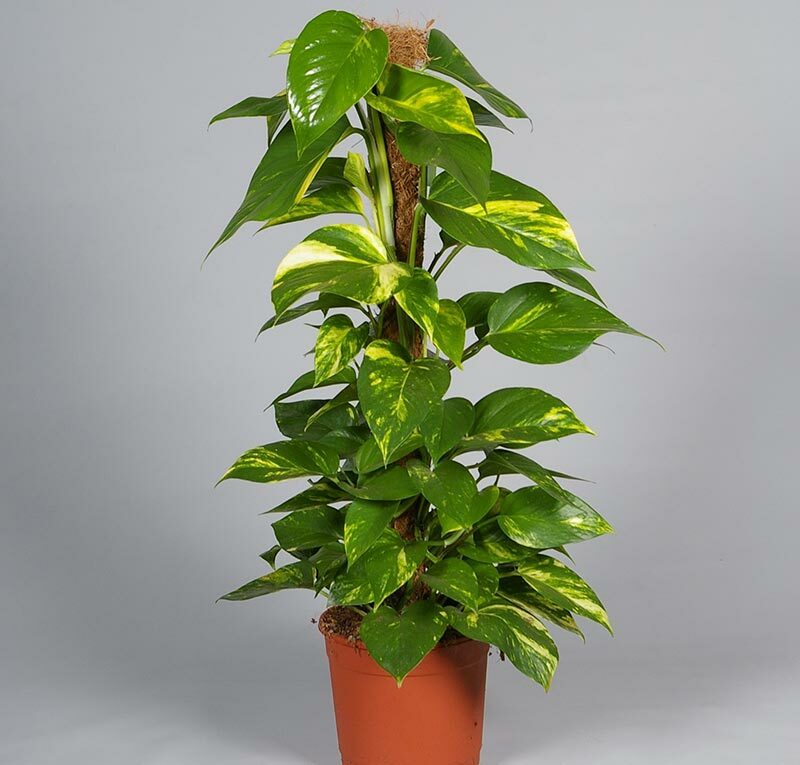 Dieffenbachia may be grown as a small tree with a canelike stem or as a shrubby plant with multiple stems. It thrives in low to medium light. Grow it at room temperature and keep the soil evenly moist. It is sometimes called dumb cane, a reference to the effects of its toxic sap, which can cause tongue numbness and swelling if chewed by children or pets. 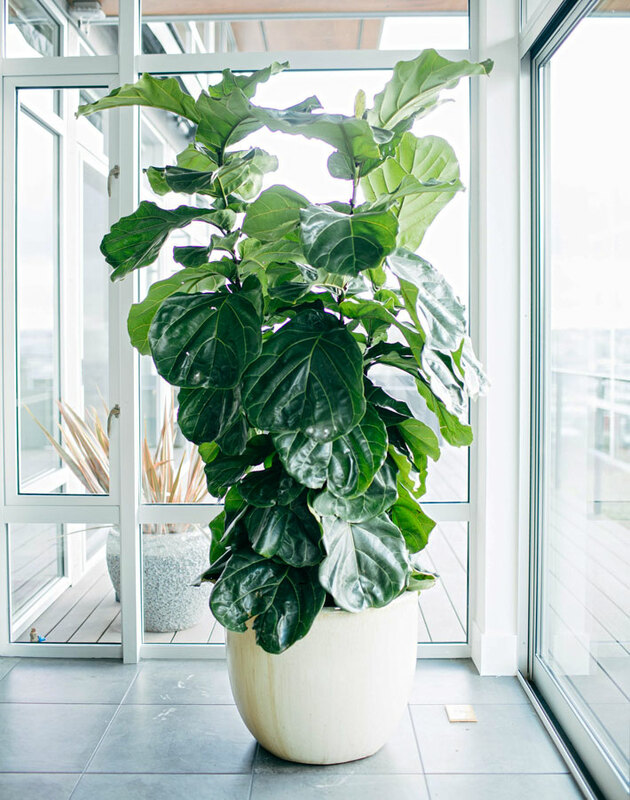 Why We Love It: Its large, green-and-white leaves create a decidedly tropical look to any room of your home (and it’s great for decorating decks and patios in the summer). This carefree succulent plant tolerates neglect extremely well. If you’ve had no success with houseplants other than plastic ones, give snake plant a try. In addition to the tall form pictured here, shorter, bird’s-nest forms are available. All types withstand low light but appreciate brighter conditions. The only problem likely to develop is root rot if you overwater the plant. Snake plant is a carefree, tough succulent that grows almost anywhere. Its leathery sword-shape leaves are usually marbled with gray green and may be edged with yellow or white. 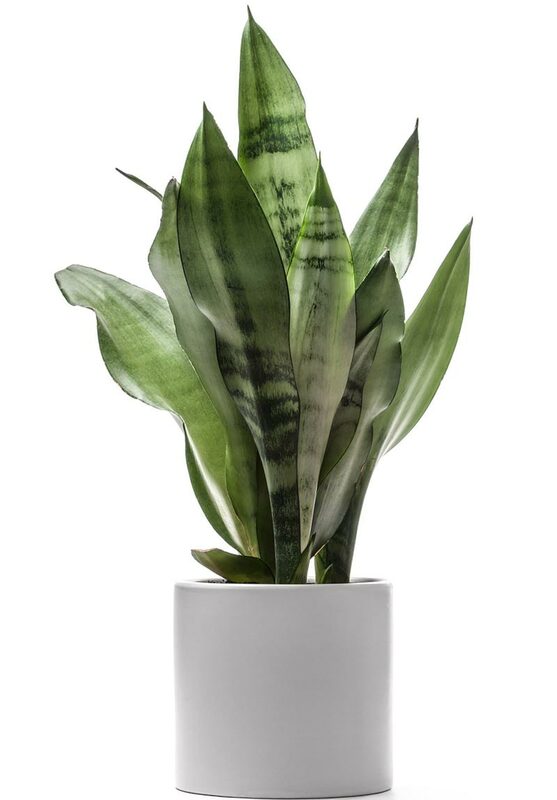 Although snake plant tolerates low light, it grows better in medium or bright light. Allow the soil to dry between waterings, especially in winter. It grows well in temperatures from 60 to 85 degrees F. It is sometimes called mother-in-law’s tongue. 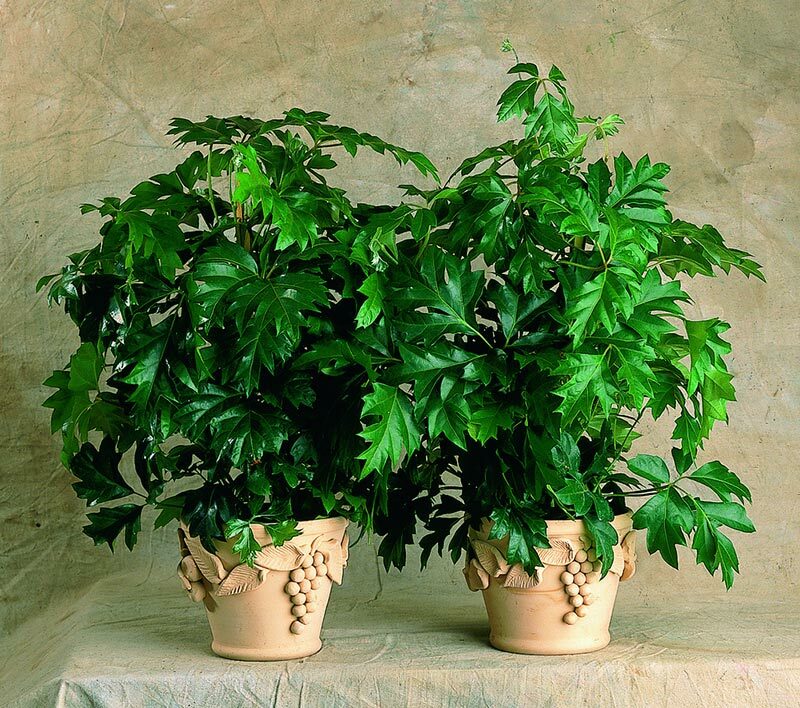 Heart-leaf philodendron is a durable foliage plant that has long been the backbone of indoor gardening. It has pretty, heart-shape leaves and adapts well to low-light spots. It is often grown with stems trailing over the edge of bookshelves or large pieces of furniture. Most philodendrons are vines that clamber in trees in their native tropical habitat, thus the common name, which translates as “tree-lover.” Most form aerial roots, which in the wild help them climb trees, and in your home can be put to use to help them climb a plant pole. They grow well in most indoor light conditions at normal room temperature or slightly warmer. Allow the soil surface to dry to the touch between waterings. Why We Love It: The climbing stems can attach to a moss pole or bark slab making it easy to create an upright tower of green. In many areas, English ivy is commonly grown as an outdoor ground cover. But you can also use it indoors. 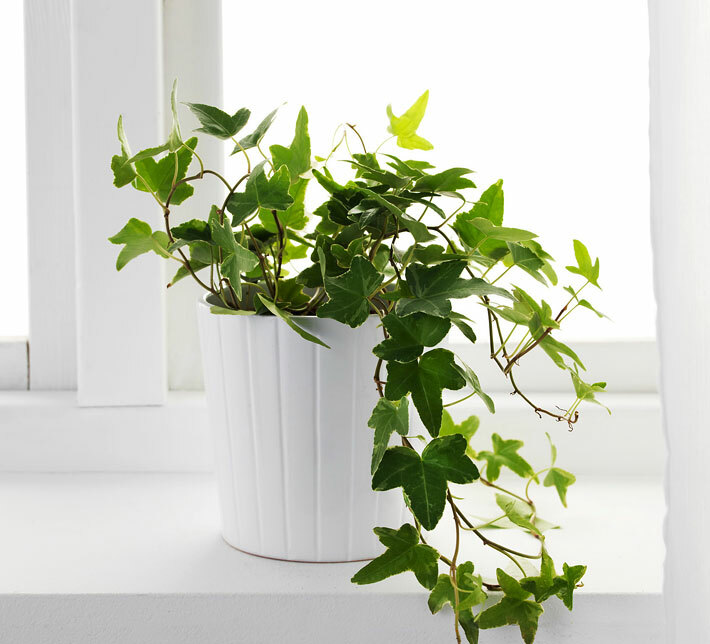 Grow a pot of ivy on a mantel or shelf where its stems can trail down. For a more formal effect, train the stems onto a topiary form. It’s also exceptionally easy to start new plants: Simply cut off a 5-inch-long section of stem, remove the bottom leaves, and pot it up in moist soil. If you keep it moist, the cutting should root in a couple of weeks. Here’s a tip: Spider mites love to attack ivy. Help prevent them by periodically washing your ivy in the shower or bathtub with room-temperature water. Why We Love It: It’s a versatile vine plant with deep green or variegated leaves. We especially love using it to create topiaries. Sometimes called eternity plant because it lasts so long, succulent zeezee plant tolerates low light and neglect. The thick, fleshy leafstalks are so durable that you might even think it’s plastic. It is a slow grower, so purchase a large plant if you want a big specimen. Cut stems remain green and healthy in appearance for several weeks, even without water. Zeezee plant tolerates low light and neglect, and still looks great. It forms a cluster of thick, fleshy leafstalks that are so glossy that they almost appear artificial. Although the plant tolerates low light, it will grow better in medium to bright light. Grow it at average room temperature and keep the soil moderately dry. It is sometimes called eternity plant because it is long lasting. Why We Love It: This plant is so easy it’s almost a challenge to kill it. Note: This plant is poisonous if eaten or chewed on by children or pets. 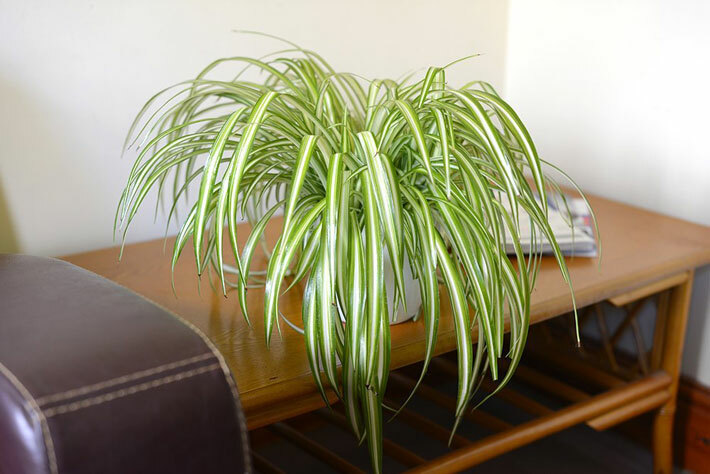 You may remember this from your grandmother’s house; spider plants have been grown for years and are still popular today. Look for a number of varieties — from types with plain green leaves to others that offer foliage marked with cream or white stripes. All make handsome hanging plants that develop plantlets at the ends of arching stems. These babies readily root in water or potting soil to start new plants. Spider plant is an excellent choice for beginners. The plant looks great in a hanging basket or on a pedestal. It likes average room temperature and humidity. Brown leaf tips, a common problem on spider plants, are due to overfertilization, low humidity, or dry soil conditions. Keep the soil slightly moist and avoid using fluoridated water on the plant. Why We Love It: It offers tons of old-fashioned appeal and an easy-care nature. One of the most common houseplants, arrowhead vine features distinctly arrow-shaped leaves (hence the moniker). Unlike a lot of plants, there are many different varieties from which to choose. Most have variegated foliage; depending on variety, the leaves may be green with white markings or bronzy-green with pink tones. Young plants form a mound about a foot high, but stems begin to vine as they mature, so you can grow them upright on a pole or let them trail in a hanging basket. 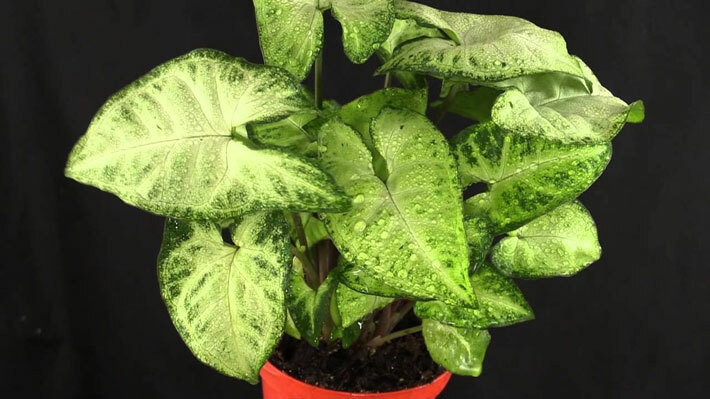 Arrowhead vine is a lush foliage plant that holds its variegation well in low light. Young plants usually remain compact mounds of foliage in various shades of green, bronze, and pink. As plants age, they develop more of a vining growth habit. Cut them back to keep them compact, or train them onto a moss pole. Arrowhead vine grows well in low to medium light with average room temperature. Keep the soil evenly moist. It is sometimes called nephthytis. By the way, you may also see this plant sold as Nepthytis. Why We Love It: The colorful leaves keep their variegation — even in low-light spots, so this is a top pick for dressing up just about any corner of your home. Note: All parts of this plant can cause irritation of the lips, tongue, and throat if eaten or chewed by pets or children. 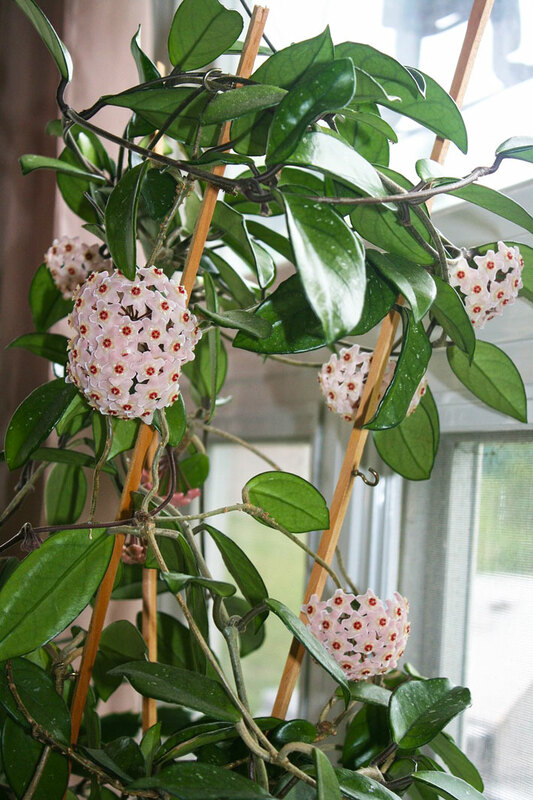 Hoya, or wax plant, has waxy green leaves and waxy fragrant pink flowers. Golden wax plant (pictured) adds creamy leaf variegation to the plant’s appeal. You can let the plant climb, train the stems onto a topiary, or allow them to trail in a hanging basket. Hoya is often called wax plant because its fragrant flower clusters are very waxy. It is a vining plant with thick leaves. 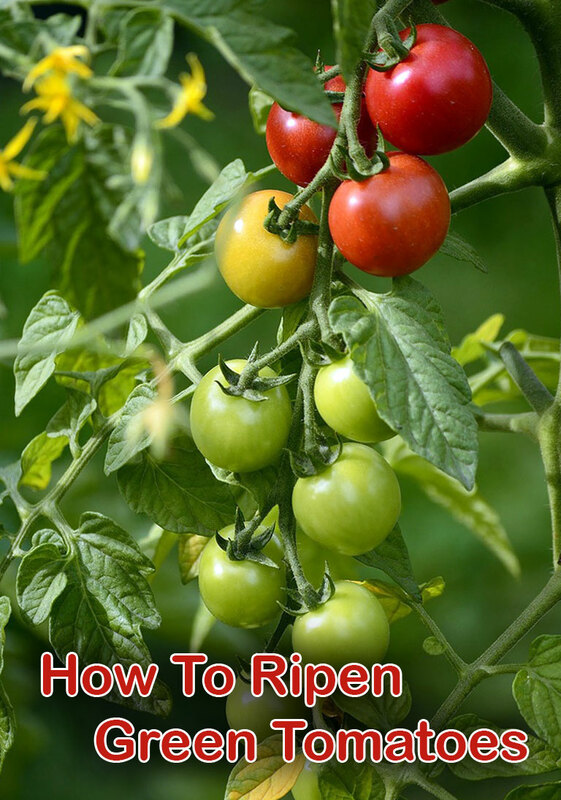 Grow it on a trellis or topiary form, or allow it to cascade from a hanging basket. Hoya needs bright light to bloom well but will grow in medium light. It likes temperatures 55-75 degrees F. Allow the soil to dry between waterings. Plants rebloom on flower stalks, so avoid pruning them off. Why We Love It: Wax plant offers beautiful flowers (that are often powerfully fragrant). It’s also a low-water plant, so it doesn’t mind if you forget to water it from time to time. An old-fashioned classic, rubber tree gets its name from the sticky, milky sap it exudes if injured. It eventually grows into a large tree, but you can easily keep it shorter by pruning back long stems, causing it to branch into a multi-stemmed shrub. Note: In frost-free areas, you may see rubber trees as a full-size shade trees outdoors. Why We Love It: Its big, dark green shiny leaves definitely make a statement. 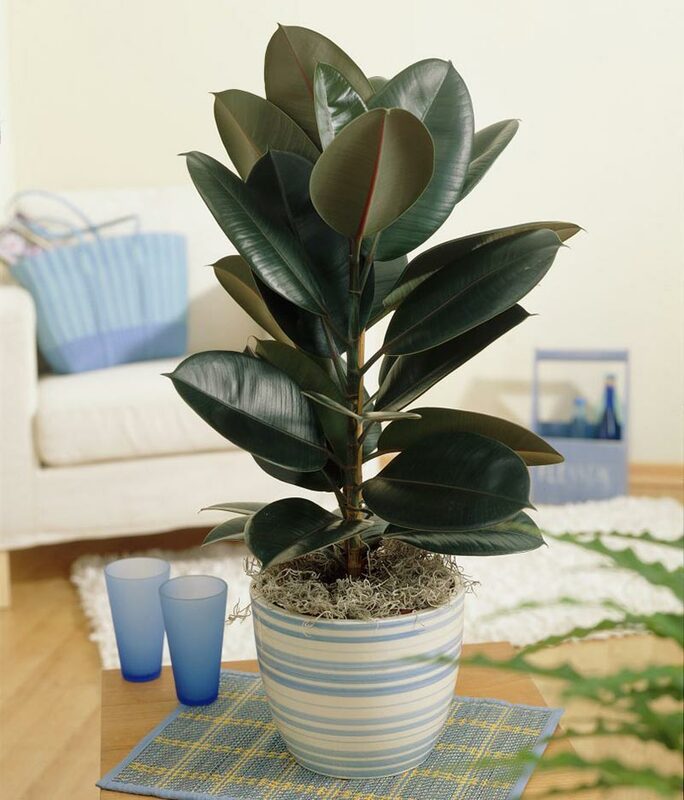 The older plants get, the larger they become — a good-sized rubber tree makes a big, dramatic accent in any room. Note: The milky white sap may cause irritation to people with sensitive skin. 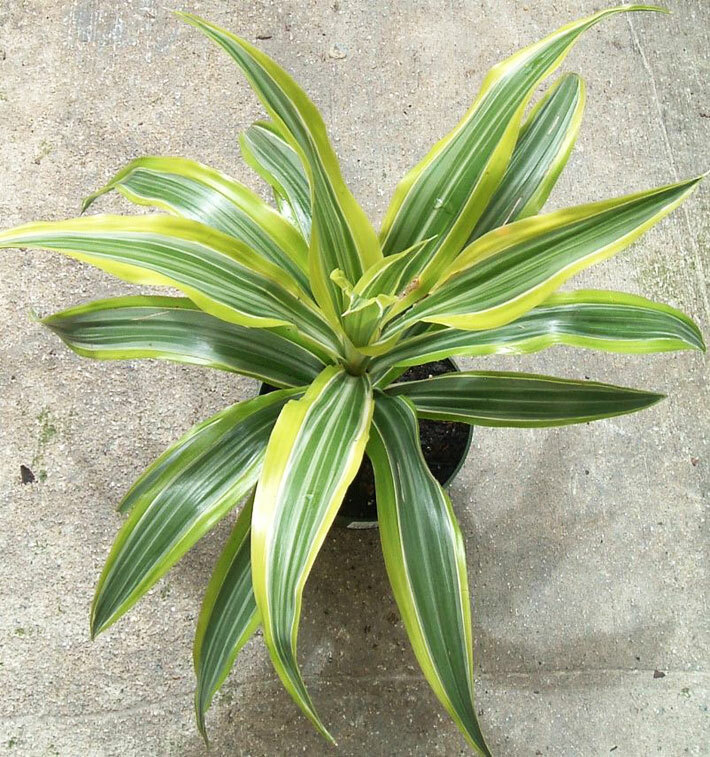 Some varieties of green dracaena, such as ‘Janet Craig’ have solid green leaves. Others such as ‘Warneckii’ (pictured), bear white, cream, gold or chartreuse stripes on their foliage. All form compact rosettes when young, but eventually become striking upright foliage plants. They tolerate low light, but produce better color in medium to bright light. 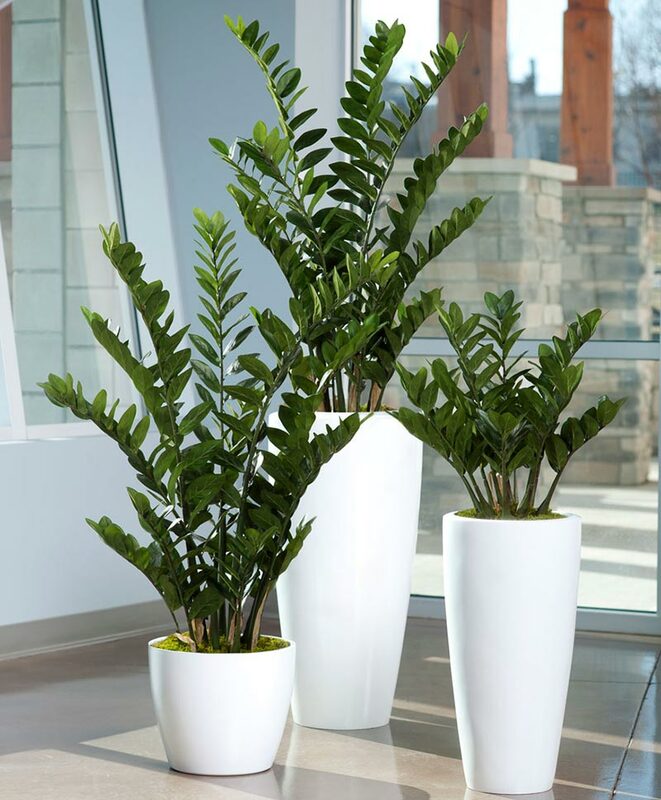 Why We Love It: It’s a durable, upright plant with good-looking leaves. Note: This plant is poisonous if eaten or chewed on by dogs. Boston fern’s arching, lacy fronds make it well suited to hanging baskets or for display on a pedestal. Don’t let its delicate appearance mislead you, though: This tough plant that will live for decades if you keep it moist and give it moderate light and enough humidity. The variety ‘Dallas’ is more compact and more tolerant of dry air. The lush arching, dangling fronds of Boston fern are especially suited to hanging baskets, but they also look great on a pedestal. 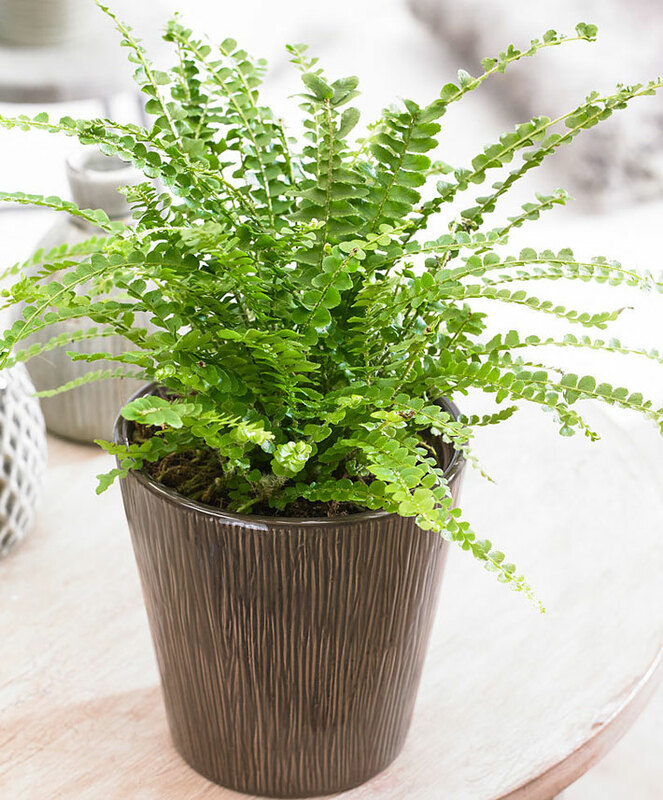 To provide the best Boston fern care, give the plant medium to bright light, high humidity, temperatures between 60 and 75 degrees F, and evenly moist soil to ensure success. Why We Love It: Boston ferns create a classic feel in any room. Their beautiful, arching fronds work well with any decorating style — but especially cottage and country. 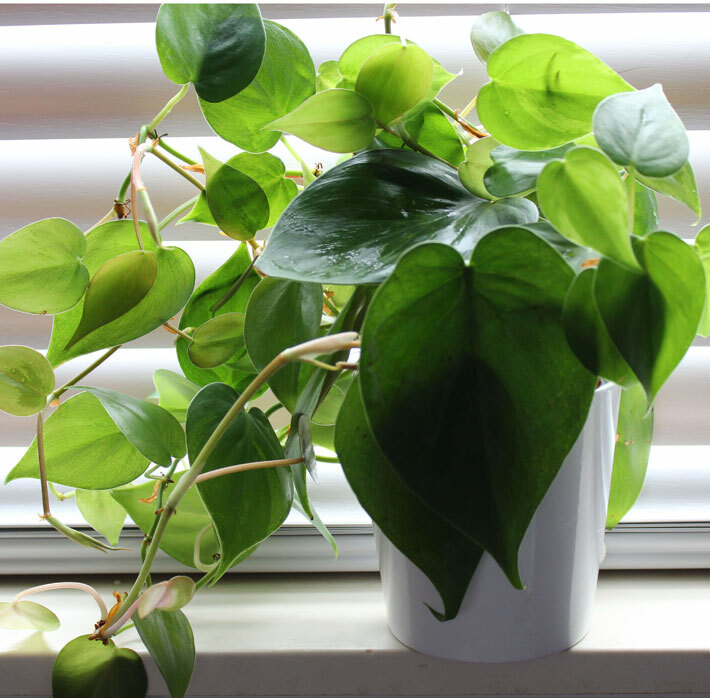 This low-maintenance vine is also commonly called pothos, and is often confused with heartleaf philodendron. Like philodendron, devil’s ivy has heart-shape leaves and can be grown as a mounding tabletop plant, in a hanging basket, or trained upright on a pole. It’s not fussy about how much light it gets, but the brighter the spot, the more variegation you’ll see in the leaves. 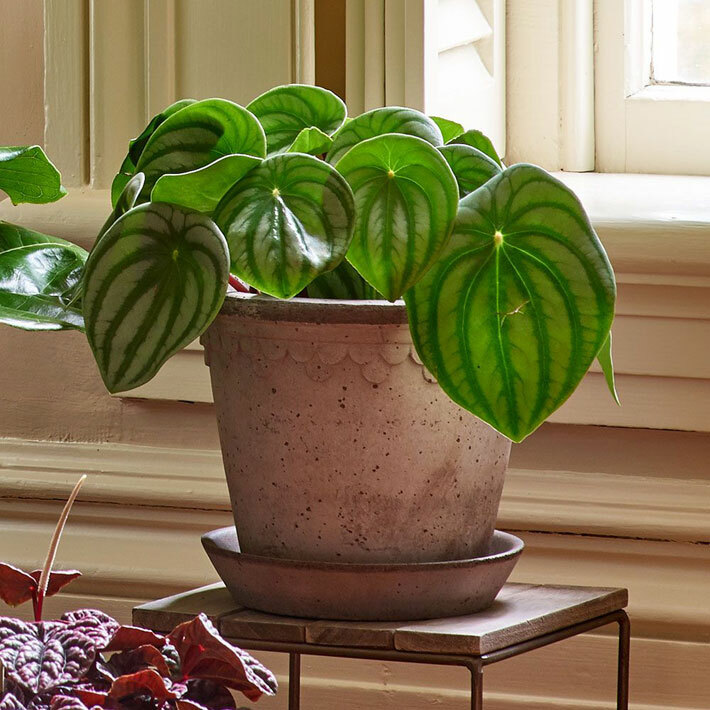 Why We Love It: Devil’s ivy is one of the more versatile houseplants you can grow. It looks great trailing out of a hanging basket, climbing up a pole or other structure, or just left to crawl over a tabletop or mantel. One of the toughest you can grow, cast-iron plant withstands neglect, low light, low humidity, and a wide range of temperatures. It grows slowly so purchase a plant that is large enough for the space in which you intend to use it. Several varieties have white or yellow variegation on their leaves. Why We Love It: This plant really lives up to its name: It’s nearly indestructible. While this showy shrub survives in low light levels, its foliage shows the best color in bright spots. Its gold, pink, and orange tones glow when backlit from a sunny window. Wash the leaves occasionally to maintain their shine and keep it looking dramatic. 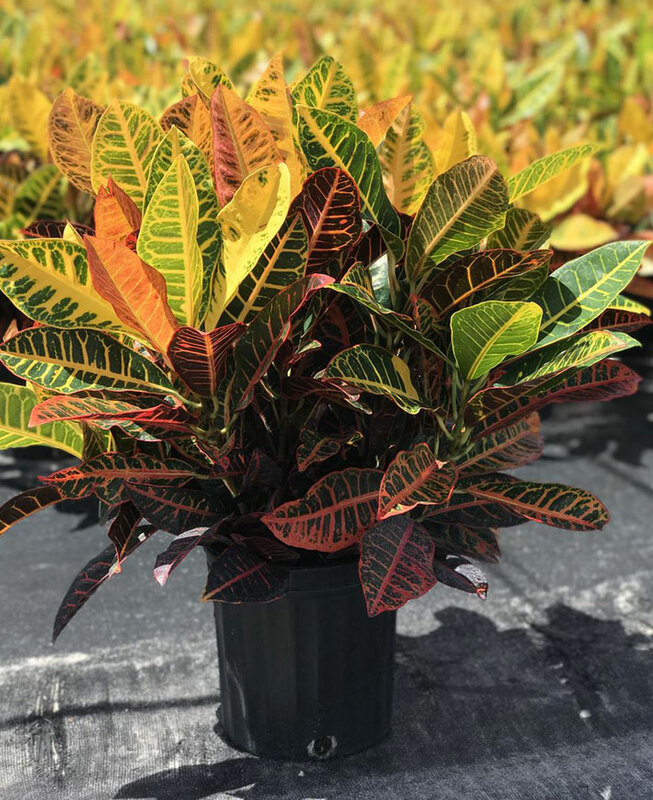 Croton is a colorful shrub with leathery leaves that are most colorful in bright light. In low light conditions new leaves will be smaller and less intensely pigmented. 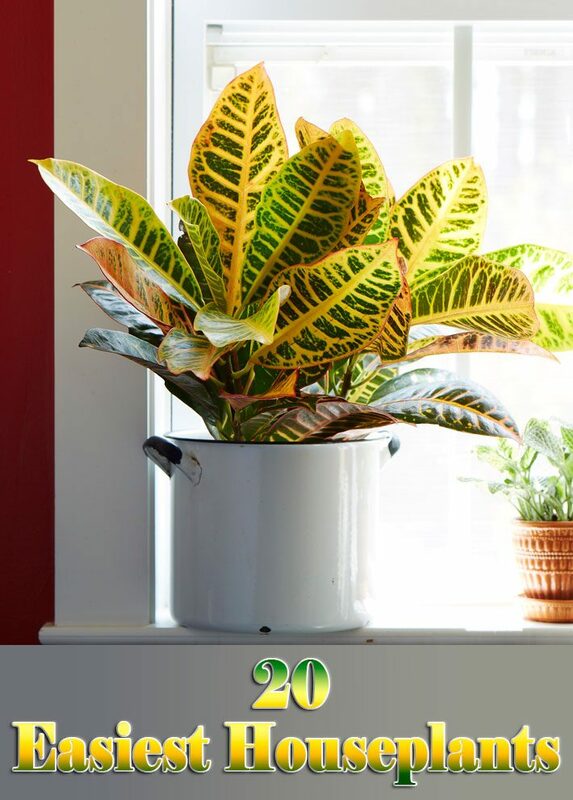 Why We Love It: It has beautiful, leathery leaves with exotic and colorful markings. Note: This plant is poisonous and can make children or pets sick if they chew on it or eat it. Despite its common name, this plant is a succulent rather than a true palm. Its graceful arching leaves are always attractive and its swollen trunk looks great, too. (The trunk holds moisture for the plant.) Keep your ponytail palm in a container only a couple of inches wider than its trunk base to control its size. It is sometimes sold as Nolina recurvata. Despite its palm-like appearance and common name, ponytail palm is not a true palm. It is a succulent with a bulbous lower trunk that stores water. Provide it with bright light and keep it relatively dry. Normal room temperature is good for it most of the year, but in winter keep it cooler (50-55 degrees F). It is sometimes sold as Nolina recurvata. Why We Love It: Because the trunk actually stores moisture, ponytail palm can survive for long periods without watering.